This post is a bit delayed, but it is the third part of my trio of posts about Android Apps for well-being. (I’m still keen for people with a knowledge of Apple devices and apps to add their input!). This one deals with Ambient Sound (including Binaural Beats), and music designed to aid meditation, concentration or mindfulness. As such it is a much more nebulous topic. 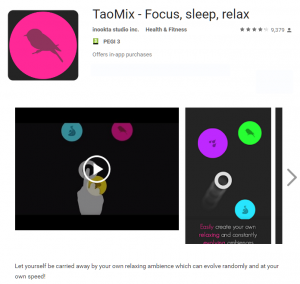 With the mood trackers featured in the first post, those apps are very specific – they have one purpose, which, although it can be presented slightly differently in different apps, is very specific. The chosen app will depend on individual taste for the actual look and feel of it, rather than content. With the second set, the mindfulness and well-being apps, they are slightly more specific, although some people will go for the scientific approach to mindfulness associated largely with Cognitive Behavioural Therapy or Acceptance and Commitment Therapy, whereas others may go for the more ancient traditions such as Buddhism and Taoism. So here are some of my personal choices in the area of Ambient Sound. This is my absolute favourite of its kind – in fact I posted a review of the app with a five-star rating on it’s Google Play Page. The free version gives a basic set of sounds, which the paid version extends (it is not an expensive purchase by any means). You can position sounds within your sound range (it works best with headphones) and it includes nature sounds – birdsong, water, rainfall, etc, as well as wind chimes, city sounds and some ‘unusual’ sounds such as electronic drones. As well as placing the sounds where you want to, you can then set your own virtual location to move around at a speed you like. So you could ‘virtually’ wander through forests, bird sounds, rainfall, to ocean, to city – the possibilities are almost limitless. It’s a great way to be mindful of sounds as well as providing a calming audio-environment for meditation. 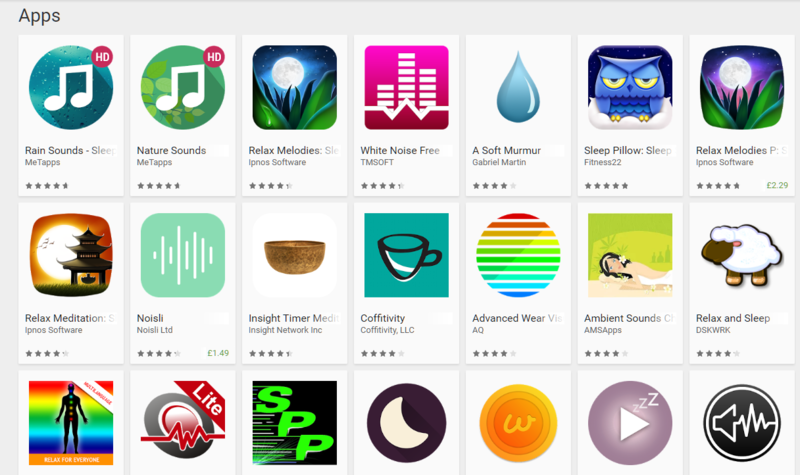 This is not the only one of its kind by any means, so please take a look around the Ambient Sound section of Google Play Store if it appeals and find the one that suits you best. 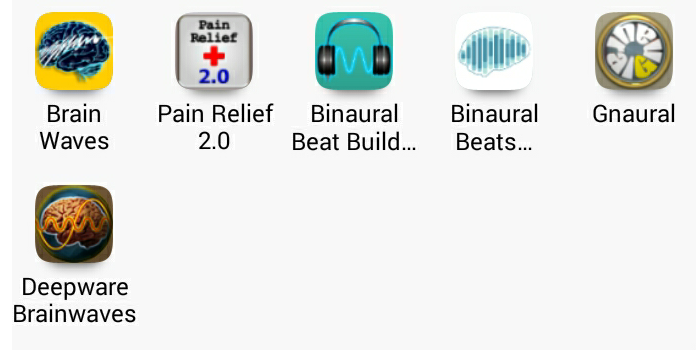 The illustration is a screenshot of the Binaural Beats apps I currently have installed. Binaural Beats are fascinating to me – as a geek and as a musician. The idea behind them is that by using headphones and creating a frequency (pitch, sound) independently in each channel (ear) and using the difference between the frequencies, the beat that is set up corresponds to a different brain state. By listening to them (quietly), they stimulate those brain states – e.g. there are states that are idea for meditation (corresponding to different types of sleep – non-REM or REM), others for concentration and creativity, and so forth. I’ll give a link to an article with more information on these waves below. Note there is an app there called ‘Pain Relief 2.0’ – that really does work for me in relieving pain. ‘Binaural Beat Builder’ and ‘Deepware Brainwaves’ allow to you to create your own sets of binaural beats. and ‘Gnaural’ is a cross-platform open source app. In the Windows/Mac versions you can create and edit your own. For the Android app, it is just a player with volume control being the only editing functions. ‘Deepware Brainiwaves’ is unusual in that it is described as a ‘Binaural DAW (Digital Audio Workstation). Again – fascinating for a musician! If you want to explore the subject further, Googling ‘binaural beats’ brings up loads of hits. The final category – ambient/meditational music – is even more subjective and personal. Whatever music calms you will work as meditation music. So these really are only suggestions, as I have a stock of pieces/tracks that work for me – including one or two tracks of my own creation. So here is a short sample list – if you can preview some of them somewhere, then explore freely. You can also find a lot of ‘Meditation Music’ apps/tracks in the play store. Steve Hillage – Rainbow Dome Musick. This was created for the ‘Rainbow Dome’ display at a Festival of Mind, Body and Spirit in the Seventies. It is ‘ambient’ in the old-fashioned sense of the word. A very calm (almost static) pair of longer tracks specifically created for meditation. Mike Oldfield – Ommadawn Pt.1. Very calming for me. I tried using ‘Tubular Bells’, which was great for the first five minutes or so – until it became the theme for ‘The Exorcist’ too. Karel Goeyvaerts – Pour Que Les Fruits Mûrissent Cet Ete. I first heard this piece when I was at college. The college library was throwing out – or rather selling at a cost of 20p per album – a whole load of LPs. I was keen on experimenting with new music, so this was among a load of contemporary music offerings I snapped up. And it is one of a couple that I have replaced in mp3 format and still listen to regularly. It is ‘minimalist’ music, played on medieval instruments. Slightly longer than the two previous examples listed, but again, extremely calming. Samuel Barber – Adagio for Strings. One of a few classical pieces for strings or orchestra that are ideal to relax to for me (other examples are Vaughan Williams ‘Fantasia on a Theme by Thomas Tallis’, Faure’s Pavane – actually the list is pretty endless). Steve Reich – Violin Phase and/or Six Pianos/Six Marimbas. Again, minimalist music – ideal for the purpose. Basically any music that helps you to relax can be used to meditate or practice mindfulness to. Sometimes it helps in taking away the bustling noise of everyday life to set up a moment of sanctuary to calm the mind in. I have used music by bands and musicians as diverse as Gong, Ozric Tentacles, The Orb, Pink Floyd, Jimi Hendrix (guess it shows my age, eh?) as well as a wide variety of classical music. I hope that these three posts on apps for well-being have contained some helpful, interesting and entertaining parts. Please – any takers to do some commenting or posting about iPhone/iPad apps…?